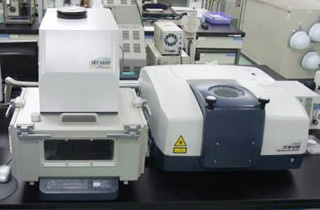 [Fourier transform infrared spectrophotometer] Daido Bunseki Research Inc. Principle When irradiating a substance with infrared rays, the infrared rays of inherent wavelengths are selectively absorbed by the substance. When infrared signals transmitted through the substance are Fourier transformed, the infrared spectrum is obtained. Since this infrared absorption spectrum is substance-specific, the substance can be identified by comparing to the database. In addition, structure change analysis can be performed by changing the spectrum.